1000 visitors in 60 days! On Saturday evening, September 27, 2008, at 6:25pm, just sixty days after adding visitor tracking to my blog, the tracking software reported it's 1000th visit! This blogging thing is fairly new to me as I have only been regularly writing since the big snow storm in early March, so I'm honored that you would take the time to read. I hope the next 1000 come even faster than the last! Be sure to tell your friends about this blog and pass on the URL, or just subscribe via the link on the right or set up an RSS feed so that you will be notified when I post! In case you are interested, my trackers also tell me that my main website, MemphisWeather.net, receives an average of 35-40 unique visitors (nearly 70 total visits) per day, with gusts much higher than that during bad weather! ;-) These visitors are loading well over 100 pages a day. My peak in the past few months has been Sept. 2 when visitor count was over 120, with nearly 450 pages loaded! Thanks again to all of you for your continued support of MWN and the MWN Blog!! While the Atlantic tropical season has quieted down considerably since Ike, we now have another system churning through the western Atlantic. Kyle is moving due north between the east coast of the U.S. and Bermuda. With wind of 75 mph as of 4pm CDT, Kyle has just reached hurricane status. The current track takes the storm to the Maine/New Brunswick, Canada border overnight Sunday night. A Hurricane Watch is posted for much of the Maine coastline north of Portland. Computer models are pointing to a possible system forming in the Gulf of Mexico in a few days and moving across the Florida Peninsula late in the week. We'll need to monitor this situation for possible development. Be sure to check out the MWN Tropical Page for the latest on current and any potential Atlantic storms. With my sincere apologies to Ryan over at KAIT-8 in Jonesboro who posted this first, but I had to copy this to my blog too. This is fantastic - I hope you get a laugh out of it like I did! As of 15 minutes ago, autumn has officially arrived! The autumnal equinox occurred at 15:44 UTC (or 9:44am CDT) this morning. An equinox, as defined by Wikipedia, is "the moment in time (not a whole day) when the center of the Sun can be observed to be directly above the Earth's equator." Further, "the center of the Sun will spend a nearly equal amount of time above and below the horizon at every location on Earth and night and day will be of nearly the same length." Checking the sunrise and sunset for Memphis today, sunrise was at 6:49am CDT and sunset will be at 6:53pm CDT. The closest we will be to exactly 12 hours of daylight and darkness (not counting civil twilight) will be Thursday/Friday of this week. Our weather for the first week of fall is pretty much right on track! Mostly sunny skies and highs in the lower to mid 80s are expected all week, while lows will run in the 60s. A surface trough has set up over the region and an upper-level trough will also move in, causing some scattered showers and perhaps a few thunderstorms to dot the region for the next 48 hours. After a very nice early autumn week, I guess we can take a few showers here and there. It will help to keep temps down some the next few days, which had crept into the mid 80s yesterday. By Sunday, the surface trough should weaken and the upper-level trough move east, so showers should be outta here. We'll be back to mid 80s (or higher) temps for the first few days next week. Since we're moving into the latter half of September, a fair question to ask is: are we done with 90 degree temperatures for this year? Well, average highs for mid-September are in the mid 80s, so while this last week was definitely nice, it was also well below normal. Given that, while a stray 90 degree day can't be ruled out, the dog days of summer are definitely over and we may very likely be done with the 90s until May '09. Time will tell! Last item: In case you are a weather junkie like me, you may be interested in knowing that there is an outlet locally where you can hang out with others of like mind. ;-) The Memphis Chapter of the American Meteorological Society/National Weather Assocation is having it's first meeting at Corky's BBQ on Tuesday night, Sept. 30th. This group is made up of not only professionals in the field, but also local weather enthusiasts. Anyone is welcome to come and learn more, or join if they would like. For more information, see our website at http://www.amsmemphis.org. Following a weird weather weekend with the passage of Ike to our northwest, fall high pressure has settled over the area, bringing low humidity, cool and dry northeast wind, and very pleasant temperatures. Morning lows have been dipping well into the 50s the past few mornings over the entire area, while highs in the 70s have been refreshing! The pattern will shift slightly over the course of the next few days as humidity ever so slowly creeps up and temperatures moderate slightly. There still are no good chances of rain in the forseeable future, so while it may be a little more seasonal temperature-wise, it will continue to be dry. The tropics continue to be quiet as well after an amazing stretch during the first half of September. Let's hope it stays that way for a while! Though it won't be nearly as bad as when it made landfall, the remnants of Ike will affect the Mid-South over the next 24 hours or so. As the center of the storm moves into southwest Arkansas tonight and then east-northeast through northern Arkansas and southern Missouri, heavy rain will fall mainly west and north of the metro area, though showers and a few t'storms are likely beginning late tonight and through at least the first half of Sunday. In addition to the rain, wind shear in the environment will increase significantly, providing the possibility of isolated tornadoes from early Sunday morning through Sunday afternoon. The Storm Prediction Center has placed areas west of the Mississippi River in a SLIGHT risk for severe weather on Sunday. The main effect everyone will feel though will be strong wind. It's already picking up today with gusts in the lower 20 mph range, but as the center of Ike draws closer, especially very early Sunday morning, sustaied wind will increase to 20-25 mph with gusts well into the 30s. Once again, stronger wind will be felt northwest of Memphis. A WIND ADVISORY has been posted for the metro area from midnight tonight through noon Sunday. A sharp cold front will move through late in the day Sunday which will drop the humidity and wind values and provide a very nice start to next week with highs in the 70s Monday and Tuesday and lows likely falling into the 50s in normally cooler suburban locations. So, until Monday, hold on to your hat and be tuned in to commercial radio or TV, NOAA Weather Radio, or MemphisWeather.Net in case severe weather strikes. 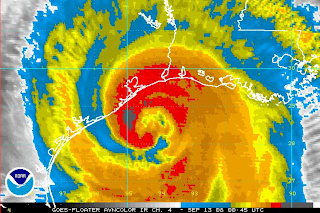 Hurricane Ike makes landfall at Galveston at 2:10am CDT 9/13/08. 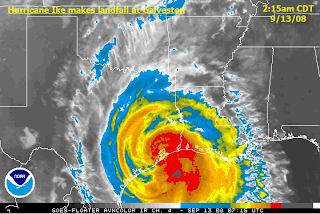 Hurricane Ike made landfall at about 2am CDT Saturday morning at Galveston, TX with the eye moving right up Galveston Bay as a high-end Category 2 storm. Daylight is just starting to shed some light on the damage that Ike has left in his wake, even as the back side of the storm moves through the Houston metro area. Max. recorded wind gusts have been between 90-100 mph at several locations throughout the area. Houston Intercontinental Airport recorded a max wind gust of 82 mph, Galveston had 89 mph gusts, and Beaumont, TX (60 miles NE of Galveston) recorded a 95 mph gust. Once more video from the area comes in, I expect to see incredible damage on Galveston Island and throughout the region. The fortunate thing, if there might be one, is that with the storm coming in directly over Galveston Bay, the expected 20' storm surge would not have inundated the Bay and shipping channel, though 8-10' of water was the likely surge there. Centerpoint, the power supplier for Houston Metro, is reporting 2 MILLION people without power. It will take, literally, months for everyone to regain power. The infrastructure damage has got to be incredible. I was out last night on I-40 and saw a huge caravan of utility vehicles headed west, likely to help out in the restoration efforts. Below is a radar image taken at 6:30am CDT as the storm was over Houston. 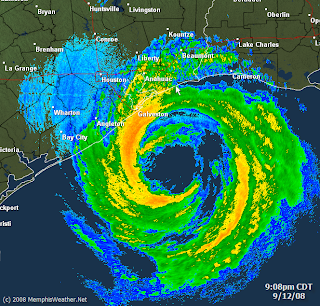 Radar image from Houston as Hurricane Ike moves ashore. Eye wall moving into Galveston. Taken at 9:08pm CDT 9/12/08. Infrared (color) satellite shot of Ike prior to landfall - 7:45pm CDT 9/12/08. More tomorrow after we see just how bad it gets. Ike is lumbering towards the Texas coast with some very interesting features. While surface wind is holding tough at 100 mph, upper level wind, central pressure, and storm structure indicate a stronger storm than surface wind indicates. The Hurricane Center is still expecting surface wind to come around with the rest of the storm and increase to the category 3 level by landfall, though forecasting intensity in this type of situation is difficult at best. A couple of things are known about the storm - on it's current track, the city of Houston and its surrounding neighbors, such as Galveston, are in for a huge black eye. Storm surge seems to be catching many people's attention with Ike as 15-20 feet of water is expected to come rolling into a large swath of coastline from Freeport to Galveston perhaps to Port Arthur. The seawall on Galveston Island is 17 feet tall, which means it could be overtopped. Waves of up to 30' are being recorded currently by a buoy just ahead of the track of the storm in the central Gulf. In addition, the massive scale of the storm makes it larger than Katrina - hurricane wind up to 115 miles from the center and TS wind 275 miles from the center. I have a bad feeling about Houston. The 4pm Advisory from NHC brings the storm right across the city. As for it's effects on Memphis weather, it appears as though the remnants may move through the Mid-South on Sunday. Look for gusty wind and perhaps a pretty good amount of rain. Check the MWN forecast for the latest info. I'll know more in the next 24-36 hours or so. I haven't blogged in several days, so it's probably time to update. My family spent the weekend at Chickasaw State Park in Henderson, TN (rural TN south of Jackson) and I haven't experienced better early September weather in a long time! Temps were absolutely perfect following a couple of cool, wet days. Clouds hung in until Saturday afternoon, so the temperatures stayed in the upper 70s to lower 80s. Evenings were very pleasant and mornings slightly cool. Made for a great weekend! Turning to current events, a cold front slipped through yesterday and resides just south of the Memphis area today. This should make for another pretty nice day with slightly below normal temps and moderate humidity. A slight chance of rain exists, mainly along the front to our south. The front returns as a warm front tomorrow and we get back into a more late summer-like regime with higher humidity and warmer conditions. Highs will be near 90 Friday and Saturday and with the humidity, it will feel like summer. Scattered showers and t'storms may help some areas. After passing over portions of the Caribbean and then Cuba, Hurricane Ike appears headed for the TX coast, somewhere between Corpus Christi and Houston. The warm waters of the Gulf and minimal upper level shear will likely combine to strengthen Ike into a major hurricane (category 3) by landfall early Saturday morning. We'll keep an eye on it. I would encourage you to read Dr. Jeff Master's blog from Wunderground Tropical. His post from this morning even includes a photograph from inside Ike's eye taken by the Hurricane Hunters in the NOAA P-3 aircraft! It's after 10am with cloudy skies, patchy drizzle, and temps still in the upper 60s! Not sure if it is really early September or early November! Thanks to Hanna, a cold front has stalled just to our east, so cooler air is filtering in behind the front and with plenty of moisture around, the clouds are hanging tough. I expect these conditions to continue through tonight before we start getting some sun tomorrow and warmer temps follow. Look for highs to remain in the 70s today, but by Sunday be back into the upper 80s. Another front is headed in Monday night, which will help to drop highs back down again by mid-week next week. Hurricane Update... Hanna is poised to strike the SC coastline overnight tonight as a strong tropical storm (65-70 mph wind) then move QUICKLY up the coast, bringing tropical storm conditions to pretty much the whole eastern seaboard from SC northward by Sunday morning. Ike, on the other hand, is still a major (cat 3) hurricane in the western Atlantic heading for the Bahamas. Forecast tracks indicate this storm will approach southern FL on Tuesday and either strike south FL or continue through the FL Straits and into the Gulf. Models are still all over the place, so we'll have to follow him pretty closely. Yesterday, parts of the area got a taste of how tropical remnants can produce severe weather, particularly tornadoes. As was the case yesterday afternoon near Oxford, MS, these funnels and tornadoes are usually weak, however they are still tornadoes and can still do damage. They also don't get produced from the same types of tornadic storms we are more familiar with in these parts - those of the supercell or squall line variety. While supercells may have storm tops that extend to 40-50,000 feet plus, tropical remnants are more low-topped (25,000 feet or so), but due to the strong to extreme wind shear that exists in these systems, funnels and weak tornadoes are easier to come by. Today, we are under a SLIGHT RISK of severe weather with the greatest threat being from weak tornaodes this afternoon and early evening that would might be produced by any stronger showers and t'storms that form in banding structures that rotate around the center of the storm. Continue to keep a weather eye to the sky as the day progresses and visit MemphisWeather.net for the latest on the severe weather threat. Great article by Paul Farhi of the Washington Post, as published in AlabamaWx.com's blog. See the article here: http://www.alabamawx.com/?p=10515 Thanks to AlabamaWx for bringing this one up! As Gustav's remnants move into northwest LA and, overnight, eastern TX, rains from the storm are pushing closer to the Memphis metro area at this time. Look for fairly high rain chances for the next 48 hours, though the edge of the precipitation will be fairly well-defined, so some areas will see decent rain, while others will remain dry within several miles of each other. In addition to the rain, showers will also produce gusty wind and some thunderstorms will also form along the edges of the precipitation. A few of these storms could produce weak tornadoes due to the high degree of wind shear in the environment, which is typical with landfalling hurricanes. In fact, at press time, a couple of tornado warnings (with one confirmed spotter sighting of a tornado) are in effect for portions of northwest MS. Keep your weather eyes and ears open the next couple of days! Elsewhere, T.S. Hanna is lingering over the southern Bahamas and is expected to start a NW track by tomorrow, paralleling the FL east coast then making landfall late in the week along the GA, NC, and SC coastline. Ike is moving steadily across the central Atlantic and is due in the Bahamas this weekend and Josephine has formed today in the far eastern Atlantic and is strengthening as it moves west as well. The Atlantic Hurricane season is in full swing!! 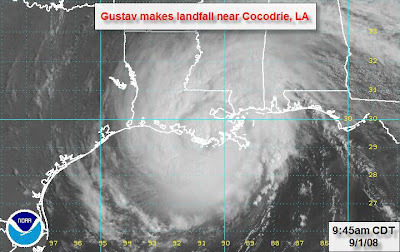 Hurricane Gustav officially made landfall at 9:30am CDT (1430 UTC), Labor Day, September 1, 2008 near Cocodrie, LA, about 70 miles southwest of New Orleans or 100 miles southeast of Lafayette, LA. 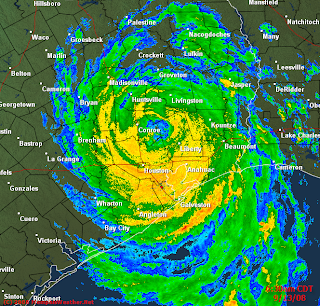 Intensity of the storm at landfall was Category 2 with 110 mph wind and central pressure of 955 mb (28.20 in). 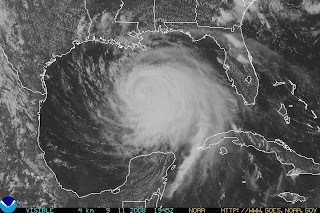 Radar from New Orleans and visible satellite image at time of landfall are below. Gustav will slowly weaken the next 6-12 hours, then weaken more rapidly as it slows considerably over western LA/eastern TX. Be sure to visit the MWN Tropical Page for more details. 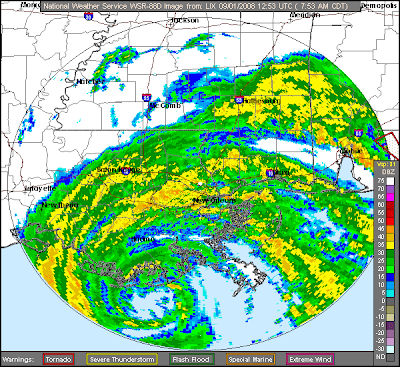 Gustav is about to make landfall south of Houma, LA at 8am. A radar image from New Orleans at 7:53am CDT is shown above. Gustav failed to increase in intensity overnight and satellite presentation remains ragged with no real eye present (in fact the hurricane hunters even failed to identify an eye). 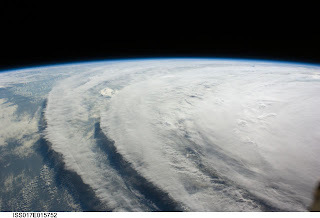 The Hurricane Center drops the storm to 110 mph at 8am - a category 2 storm. I find it odd that a storm without a definite eye (for hours now) and one that all sampled data (like dropsondes, flight level sampling, and satellite estimates) would indicate as a slightly weaker storm, would still be a major hurricane up until 2 hours ago, then it is dropped to category 2 right before landfall... This is what people will remember and how it will be written in the history books - a Category 2 storm that just missed New Orleans. 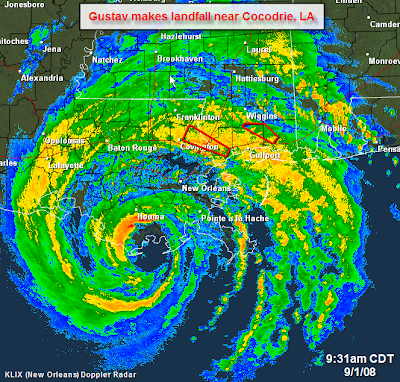 Given all that, Gustav is still an extremely dangerous storm. Storm surge will be an issue along the southeast LA and MS coastlines. New Orleans should not see the same issues with levee failure and surge that they saw with Katrina since the storm's path will not be pushing water out of the Lake into the city, but very heavy rain could still inundate portions of the city. Obviously, wind damage and flooding rains will be a major issue. Up to 6-12" of rain can be expected across LA, southern MS, and southern AL, with even more expected for western LA and eastern TX as the storm stalls over this area in the coming week. We'll still be talking about flooding in these areas a few days from now. Hurricane-force wind will be felt across southern LA and into central LA as well, and tornadoes are possible east of where the storm makes landfall, including southern MS and AL, the FL panhandle, and southeast LA.